Yogi Bear is a big fun loving bear who has an affinity for picnic baskets. He is constantly getting into mischief and always causing problems for Park Ranger Smith. There are lessons to be learned from Yogi and his escapades. Some of those lessons are listed below. Perseverance – In the first episode of Yogi Bear, Yogi tries hard to leave the park. He is tired of all the tourists and makes up his mind to leave. Eventually he does get out of the park. When a person really perseveres, just about anything is possible. 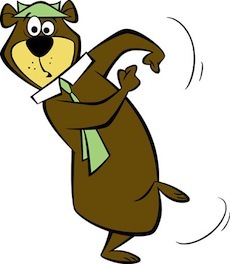 Be a creative problem solver – Yogi Bear is very creative in thinking up ways to leave the park. Creativity in problem solving is a valuable skill to learn as a child and it serves you very well as an adult. Be aware of the consequences – Oftentimes, kids want to do things without considering the consequences. Yogi tries hard to leave the park reserve, but he doesn’t stop to realize that in leaving, he forfeits his safety. In fact, the day he finally does make it out of the park is the first day of bear hunting season. It makes sense to teach kids to think about consequences before they put their plans into action. Good friends are a gift – Boo Boo Bear is Yogi’s best friend. He is always there for company, encouragement, and occasionally, as the voice of reason. A good friend sticks by you no matter what happens, and Boo is just that kind of friend. Good friends also point out to you when you are about to make a mistake. Boo Boo tries to help Yogi keep from making mistakes, but Yogi has a mind of his own when it comes to the things he wants to do. Determination can get you what you want – Yogi is always determined to get a fresh picnic basket, or at the least, grab some food from an unsuspecting tourist. Sometimes he is successful, but there is always a price to pay. If one is determined enough, you will probably reach your goal, but you must be willing to pay the price. Rules are in place for your own safety – Yogi doesn’t seem to realize that the rules of the park reserve are there for his benefit, as well as those of the visitors. He invites trouble by always breaking the rules. Kids need to learn that most rules are there to keep them out of trouble and keep them safe. Sometimes you should listen to your friends – Boo Boo is constantly encouraging Yogi to pay attention to the warnings of Ranger Smith. Most of the time Yogi refuses to listen. Sometimes our friends tell us things we may not want to hear, but they are things we probably need to hear. Be honest – It seems like it is difficult for Yogi to be honest in his dealings with Ranger Smith. Yogi is always looking for a way to circumvent the park rules. Yogi’s dishonesty always lands him in trouble. Honesty is the best policy. Keep a cheerful attitude – It seems that no matter what the situation turns out to be, Yogi always has a cheerful attitude. Even when he gets in trouble, he still seems to keep a smile on his face. Keeping a cheerful attitude has many benefits. Kids actually want boundaries – In the episode, “Home, Sweet Jellystone,” Ranger Smith leaves Jellystone to retire. At first Yogi is very happy because it means he can swipe all the picnic baskets he wants. He soon learns that he really misses the boundaries that were in place. He ends up scheming to get Ranger Smith back in the park. It’s interesting that kids are the same way. Even though they push to find out how rigid the boundaries are, they are more secure when they have boundaries. Using cartoons to uncover lessons about life and living is a great way to spend time with your kids. Teaching them how to look for positive lessons in the shows they watch helps them develop critical thinking skills which will serve them well as they mature.